Sao Sreymao is a freelance illustrator who has studied at PHARE Ponleu Selpak art school in Battambang. 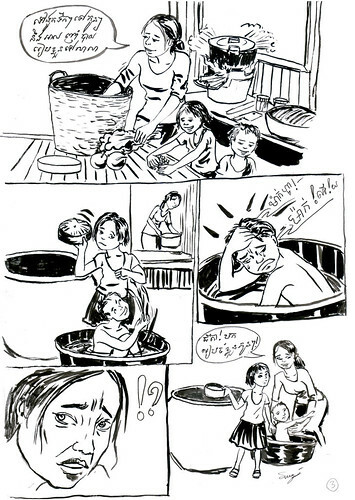 She has developed a graphic novel as a part of Phousera ‘Séra’ Ing’s [RE]Generations project. Sao Sreymao has regularly participated in local community comics events, including 24 Hour Comics Drawing Day and ‘ComicKaze‘. Sao Sreymao’s art has been exhibited in 2010’s [Re]Générations: Exhibition and 2011’s [Re]Générations: Romances Exhibition (slideshow), both at Centre Culturel Français, Phnom Penh.